How I created my first ever cosplay costume: a female Marty McFly made for Tampa Bay Comic Con 2015. 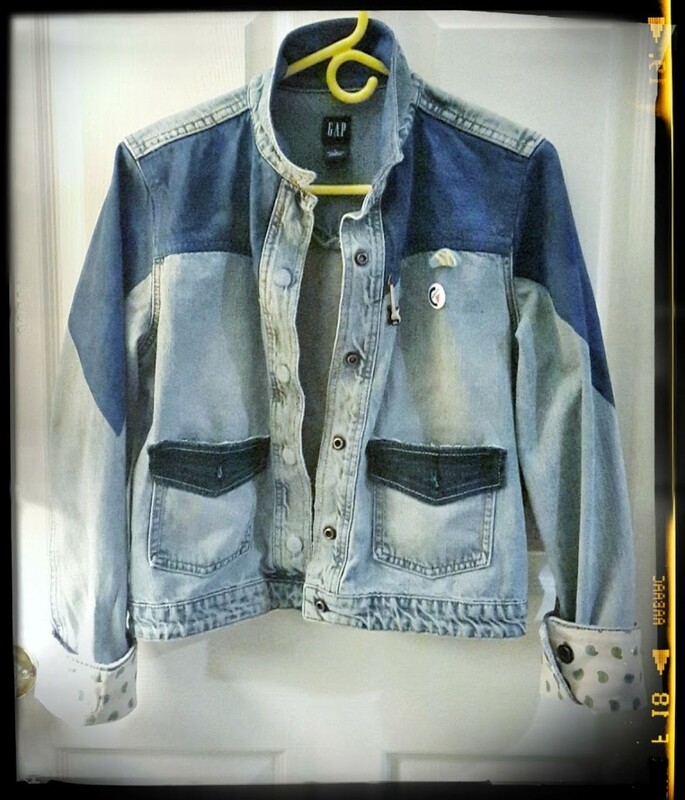 In this part, I detail how I made my own DIY version of the famous Marty denim jean jacket! 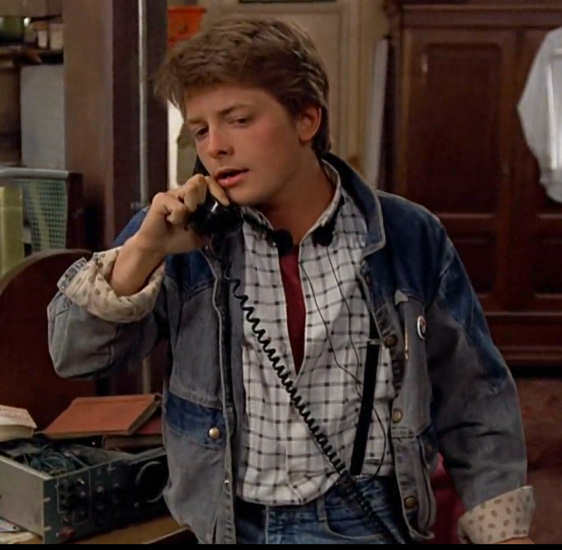 Marty McFly’s 1985 two tone denim jacket screenshot for costume reference from Back to the Future. 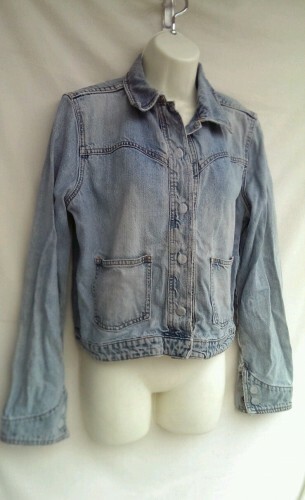 The original Marty McFly screen-used denim jacket was listed as a giveaway in the September 1985 issue of Teen Beat. The contest even made the cover! Sadly, no one knows what ever happened to it, though lots of interested parties have been – and still are! – looking and inquiring for any leads as to the results of the contest, the winner, etc. 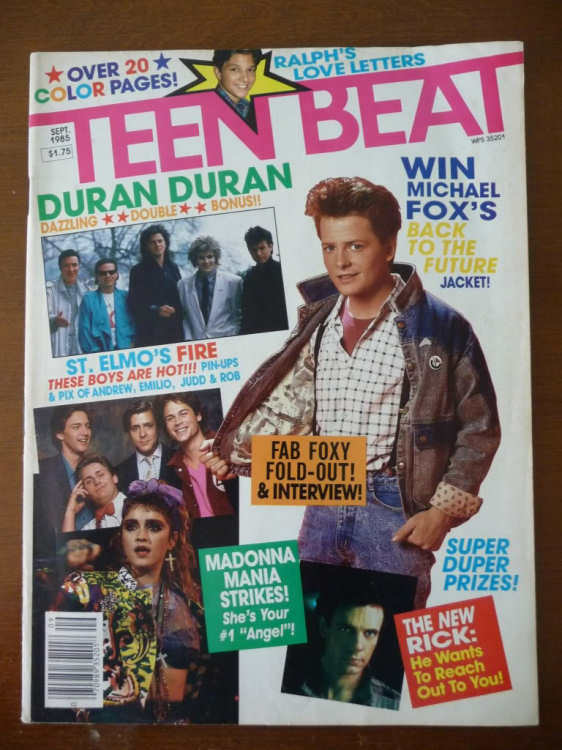 September 1985 Teen Beat Cover with Back to the Future Win Michael J. Fox / Marty McFly’s Jacket contest. There are options out there to buy a replica. Some are better than others. Most are hundreds of dollars. Any of the George Marciano Guess jackets in similar shapes and/or colors that do show up on ebay tend to also go for large sums of money – and still need modifying anyway. I spent a lot of time searching through listings and thrift stores for something I could use for mine. Ultimately though, it came back to the fact I was trying to make a female Marty McFly costume. Which meant any men’s jacket was going to start off far too bulky and boxy for my feminine build. What I needed was something that had a similar enough style and raw bones that I could modify to look close enough to Marty’s original. I didn’t need it to be 100% screen accurate. I’m not going for a perfect replica but it was important to find something with enough “good bones” to be able to minimize my modifications. I initially limited my search to vintage Guess jackets but most were distinctly different from the film jacket. 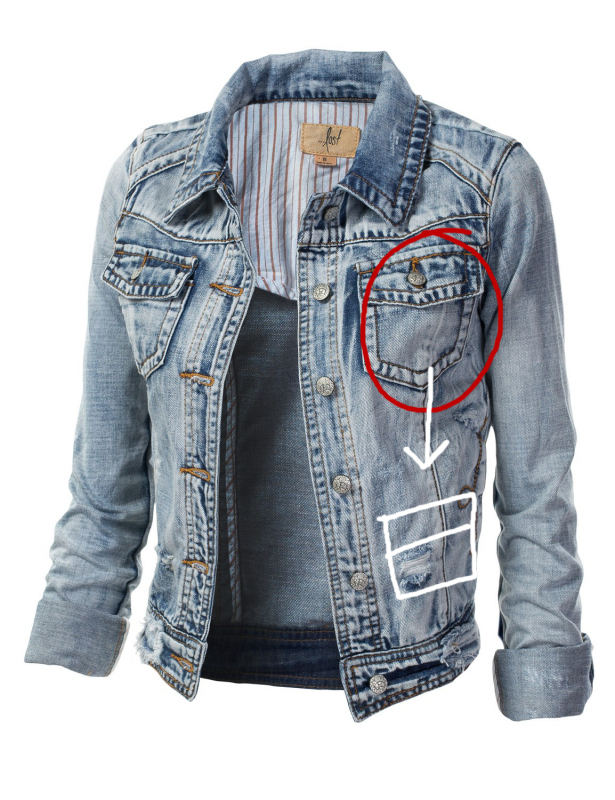 Notably, it’s really hard to find a denim jacket where the pockets aren’t up on the chest area. I needed them lower. Almost all jean or denim jackets for women have pockets up on the chest but for my female Marty McFly cosplay jacket I needed them to be lower in position closer to the waist. Ultimately, I found this. It’s a vintage Gap jacket. The pockets were in the right place. It had a good pale denim coloring. And, this jacket featured a nicely defined section on the top which could be colored to match the two-tone style of Marty’s original jacket. Vintage Gap jacket I used as my starting point in making a replica Marty McFly 1985 denim jacket as part of my female Marty McFly cosplay for Comic Con. I debated several options for modifying the two-tone color block of Marty’s jacket, including adding fabric panels but I’m not seamstress and I didn’t feel confident not completely screwing it up. I lucked upon Lumiere by Jaquard Metallic Acrylic Paint one day while browsing around an art supply store. It mentioned being able to use on a wide variety of materials – including denim. 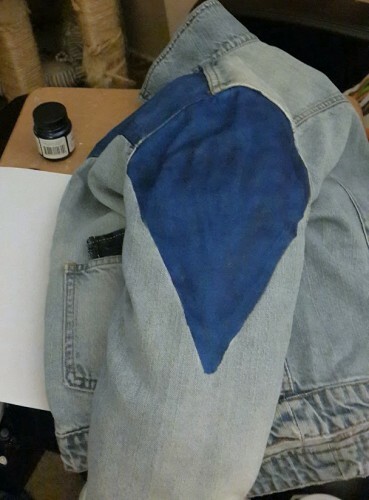 I did a section at a time, using a foam brush and a nice, thick coat of paint, making sure I saturated the denim fully to give it a uniform color. I would then let each section dry for 24 hours. 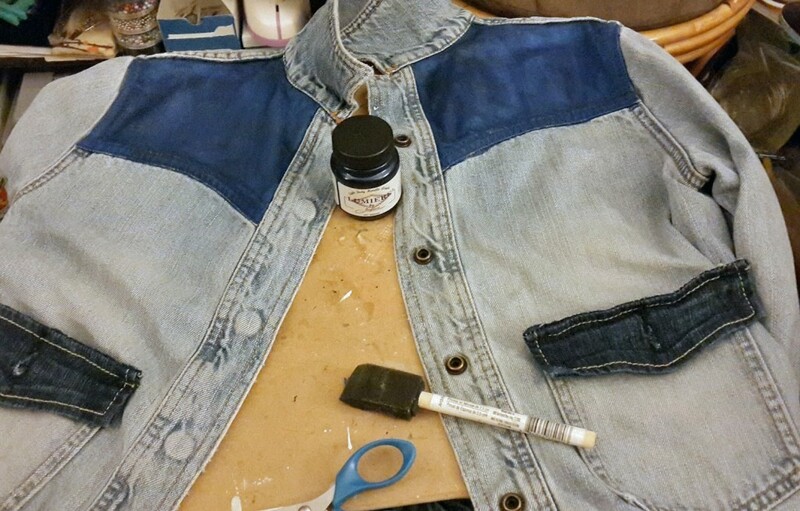 In progress as I modify a denim jacket to be my ladies version of the 1985 Marty McFly two-tone jean jacket. Continuing the two tone paint job of my female marty mcfly jean jacket. I went back to the film for reference shots and noted the inside of the collar is dark blue and got an approximation of the dark blue points on the sleeves. I made a template out of paper to ensure both sleeves were the same size, shape and length of point. This was the hardest part as I had to stuff the sleeves with a towel to make a flat surface to paint. It kept wanting to crinkle or fold. 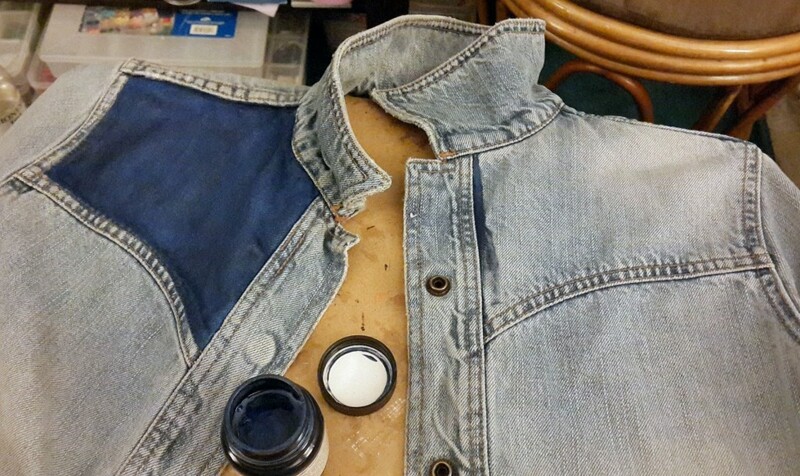 Making the dark denim sleeve points of my Marty McFly cosplay. After all parts were completed, I followed the directions and heat set it. The fabric was stiff from the paint, but it says that after heat setting, you can wash or dry clean it, so I crossed my fingers and tossed it in the washing machine on gentle with fabric softner. And it totally worked! After washing and drying, the painted parts felt almost completely like the unpainted parts with flexibility again! 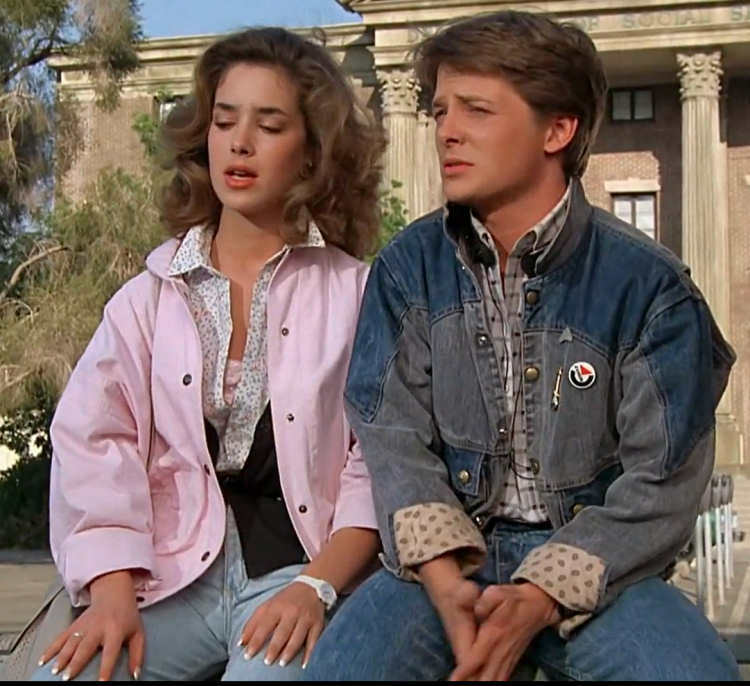 Marty McFly 1985 denim jacket screenshot reference from Back to the Future. I cut the back pockets off a pair of jeans and fabric glued them to give the look of the “flaps” on the pockets. Then I purchased some custom paisely fabric from Spoonflower for the cuffs. 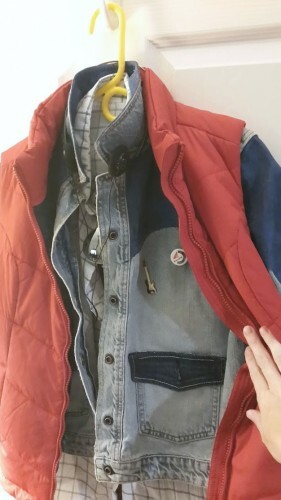 In progress details shot of my ladies Marty McFly cosplay version 1985 denim jacket. Initially, I tried using “Heat n’ Bond” to fuse it to the denim, but it totally would not stick!! I asked around and Wonder Under was recommended. I bought a yard of it at Joann and tried again. It probably took about two hours to fuse the cuffs together. The shape made it tricky and I wanted to make sure every bit of it would stay firmly in place. Thankfully it worked! 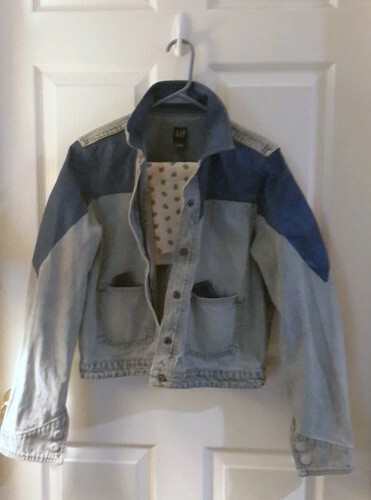 My completed 1985 Marty McFly jean jacket for my female Marty cosplay complete with two tone color scheme and paisley print fabric cuffs. Come back for Part III to look at the little tiny details and finishing touches that completed my female Marty McFly cosplay! *Some people state that the jacket was available commercially as an off-the-rack item at the time of the filming. They argue that because Michael J. Fox was a late recast for Eric Stoltz six weeks into filming, they didn’t have time to make custom costuming for him. Some claim it was manufactured in Mexico but others say Guess did not have manufacturing in Mexico at the time. Proponents of it being retail claim that versions have popped up on ebay over the years or there’s a “friend of a friend” who remembers having it, or someone says they found one in their mom’s closet or whatever but never any real, tangible proof. Just a lot of hearsay. Which leads us to the general opinion that it was likely custom made. More specifically, that it was a combination of two retail Guess jackets of the period. Some people have said that crew attached to BttF have confirmed it was custom. Others point to the fact that no legitimate versions have ever surfaced and if it truly were mass produced, we would have seen at least one by now! Plus, there are specific features and finishes on the jacket that are different from anything even close that has shown up furthering the consensus that it was a custom piece.